Statistical highlights of the second ODI between India and Sri Lanka, on Mohali on Wednesday. 208 Rohit Sharma's superb unbeaten innings of 208 is the second highest by a captain in ODIs -- the highest being 219 by Virender Sehwag against the West Indies at Indore on December 8, 2011. These two innings are the only double centuries by captains in ODIs. 3 Having registered two double centuries previously -- one each against Australia and Sri Lanka -- Rohit, with his unbeaten 208 against Sri Lanka in Mohali on Wednesday, has become the first batsman to hit three double centuries in ODIs. Apart from Rohit, no other batsman has registered even two. The other players combined have recorded only four double hundreds - one each by Sachin Tendulkar, Martin Guptill, Virender Sehwag and Chris Gayle. 5 Rohit equalled the record of posting five innings of 150 or more in ODIs. India's Sachin Tendulkar and Australia's David Warner are the first two to achieve the feat. 6 Rohit has posted six centuries this year in ODIs, emulating Virat Kohli's tally in 26 innings. He becomes the third Indian opening batsman to record six hundreds or more in a calendar year, joining Sachin Tendulkar (9 in 1998 and 6 in 1996) and Sourav Ganguly (7 in 2000). 2 The top two innings -- both double hundreds -- for India vs Sri Lanka in ODIs have been played by Rohit. His previous double hundred against them is 264 at Kolkata on November 13, 2014 -- a record for the highest individual innings by any batsman in ODIs. His first double hundred in ODIs was 209 off 158 balls vs Australia at Bangalore in 2013. 5 Rohit's fifth hundred vs Sri Lanka is his 16th in ODIs, bettering Virender Sehwag's tally of 15. Only three players have recorded more centuries for India -- Sachin Tendulkar (49), Virat Kohli (32) and Sourav Ganguly (22). 3 Rohit's third Man of the Match award vs Sri Lanka is his 12th in ODIs. 4 Sharma is the first player to be adjudged Man of the Match four times this year in ODIs. 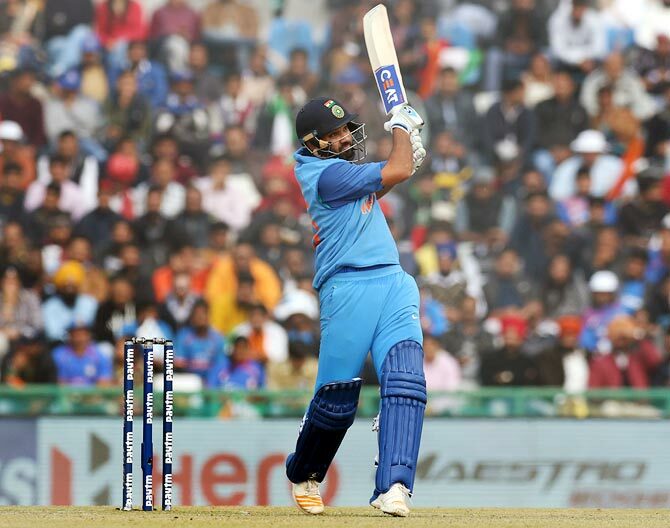 12 Rohit recorded 12 sixes during his double century knock at Mohali -- the second highest tally by a captain next only to the 16 during his innings of 149 off 44 balls vs West Indies at Johannesburg on January 18, 2015. 45 Rohit has hit 45 sixes already in 20 innings this year -- the most by an Indian batsman in a calendar year in ODIs. 23 Shikhar Dhawan (68 off 67 balls) has posted his 23rd fifty in ODIs - his fifth vs Sri Lanka. Despite recording 5, 4 & 0 vs Sri Lanka in his previous three innings in August this year in Sri Lanka, Dhawan is averaging 63.07 against them - his tally being 883 in 15 innings. 12 The 115-run stand between Rohit Sharma and Shikhar Dhawan is their 12th for the first wicket, equalling the tally of Tendulkar and Sehwag. Only one opening pair has registered more century stands for India -- 21 by Tendulkar and Ganguly. 1 Shreyas Iyer (88) has posted his first fifty in international cricket. 3 The top three Indian batsmen have managed 364 runs -the highest tally for India in an ODI - the third highest overall in ODIs. The highest being 430 for South Africa vs Australia at Johannesburg on January 18, 2015 -- Hashim Amla (153), Rilee Rossouw (128) and Abraham de Villiers (149). 213 Rohit and Iyer were involved in a stand of 213 for the second wicket - India's first double century stand for any wicket in ODIs at Mohali. The said stand is the second highest by any pair at this venue next only to the 221 for the third wicket between Hashim Amla and Abraham de Villiers for South Africa vs Netherlands on March 3, 2011. 141 India's 141-run triumph is their biggest by runs margin at Mohali, obliterating the 64-run win vs Zimbabwe on March 10, 2002. 3 India (392/4) have recorded their third highest total in ODIs at Mohali - the top two being 414 for seven at Rajkot on December 15, 2009 and 404 for five at Kolkata on November 13, 2014. India's total is the highest by any nation at Mohali, outstripping the 351 for five by South Africa vs Netherlands on March 3, 2011. Their previous highest total at this venue was 321 for nine vs Pakistan on November 8, 2007. 100 India became the first team to register 100 totals of 300-plus in ODIs, followed by Australia (96), South Africa (79), Pakistan (69) and Sri Lanka (66). 106 Nuwan Pradeep (10-0-106-0) has conceded 106 runs -- the joint-third most by a bowler in an ODI. Mick Lewis of Australia had conceded 113 runs against South Africa at Johannesburg on March 12, 2006 and Wahab Riaz of Pakistan 110 against England at Trent Bridge, Nottingham on August 30, 2016. Bhuvneshwar Kumar (India) had conceded 106 against South Africa at Mumbai on October 25, 2015. 2 Angelo Matthews has posted his second century in ODIs. He has scored both his centuries against India on Indian soil- both unbeaten - 139 at Ranchi on November 16, 2014 and 111 at Mohali on December 13, 2017. Unfortunately, Sri Lanka have lost both the ODIs. In the course of his unbeaten 111 at Mohali, he became the tenth Sri Lankan batsman to amass 5,000 runs or more in ODIs - 5048 at an average of 42.06 in 194 matches.